Enter your email address to subscribe to the 1st Welwyn web site and receive notifications of new posts by email. During the month of June we're running a fund raising competition. We are raising money to purchase some camping equipment. The competition runs to 30th June. The top fund raiser from each section will win a prize. All money raised, including sale from ducks will be included. Happy fund raising! In the month of June we are launching a fund raising competition. We want to see who can raise the most money for the Welwyn Scout Group. Prizes will be awarded to the young people from each section (Beavers, Cubs and Scouts) who raise the most money. Last year we raised just over £1,000 during Welwyn festival week. This year we want to smash that and have set our target to raise £1,500 during fund raising month. Can you help us! Get your thinking caps on. What are your children (or you) going to do to raise money for the Scout group. You could do a sponsored walk, run, cycle, silence. You could make and sell cakes or biscuits. This is a fun and easy way to raise money. 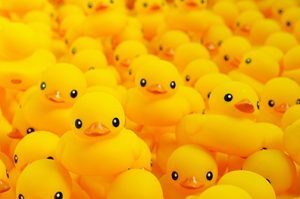 At the end of the Welwyn Fun Day (on 30th June) we run a district famous Welwyn Duck Race. We release 1,000 rubber ducks into the Mimram river and they “race” down the river to the bridge. Each duck is numbered and can be backed for £1 each in advance. 1st Prize £50, 2nd Prize £30, 3rd prize £20. You can start raising money for the competition by “selling” ducks to your friends and family in advance. For each £10 you raise we will send you a list of numbers to give to your friends of family. You can either donate by clicking on the button below or you can bring the money to the next meeting in an envelope with your child’s name, section, money raised, your email address (so we can send you the numbers) and the words Duck Race on the front. Once you have raised your funds please click the button below to donate, or bring your money along to the next meeting in a sealed envelope with your child’s name, section and money raised on the front. to the next meeting This will then be added to the totaliser. We are also looking for a couple of super volunteers to take the lead and co-ordinate the fund raising activity on one or more of the dates above. This would involve planning for the day, co-ordinating the volunteers, making sure you have all the equipment (e.g. Ducks for the duck sales) on the day. So if you and/or your child would like to lead one of the dates above please post a comment below and we’ll get back to you.